Many of you recall saving Spam can labels and sending in for a Spam T-shirt (or maybe just those of you in Hawaii or Minnesota). 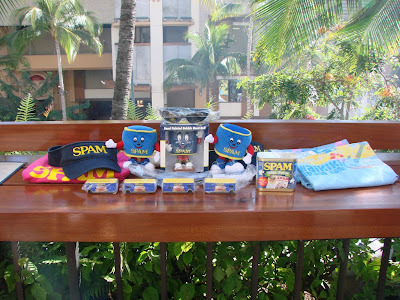 At SpamJam there are all sorts of Spam merchandise for sale or in our @atmarketing tweetup as spam swag giveaways. Everything from plushies to puzzles, shirts, visors and so much more. This ends our series for all of you who missed out never fear just wait for Spam Jam 2011 coming to Waikiki in April 2011. 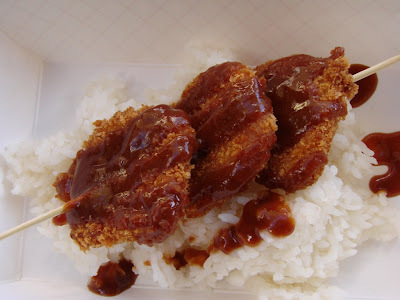 We wrap up our food shots from the Spam Jam with the Spam Katsu from Cheeseburger Waikiki. Katsu began in Japan as Tonkatsu which was actually a pork cutlet that was breaded and deep fried. In Hawaii a variant called Chicken Katsu made with chicken instead of pork if popular at many fast food places such as L&L or Graces. So it is fitting that Spam Katsu appears at the Spam Jam and it was pretty good too though I’m not sure I’d want to eat a huge quantity of it in a plate lunch. Check out our Spam Jam Photo Album. 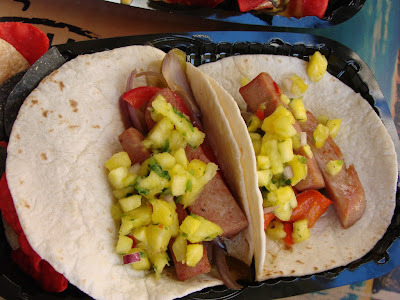 Today we feature the Spam Fusion Fajitas from Jimmy Buffet’s at the Waikiki Beachcomber. This is actually an award winning entry from Stay Slagor of San Diego who won the national Great American Spam Championship. It was chosen from over 800 entries and as a prize Stacy won a trip to Hawaii to attend the Spam Jam. We have never done this in our photo blog history but here is the winning recipe. If you do it right it will look like the photo you see. Combine salsa ingredients; set aside. Heat olive oil in large skillet over medium-high heat. Add onion and bell peppers. Saute 5 to 8 minutes, until lightly browned and softened; remove and set aside. In same skillet, fry Spam until lightly browned, about 5 minutes. Return onions and peppers to skillet and stir to combine. Spoon onto tortillas. Top with salsa. Serves 4.